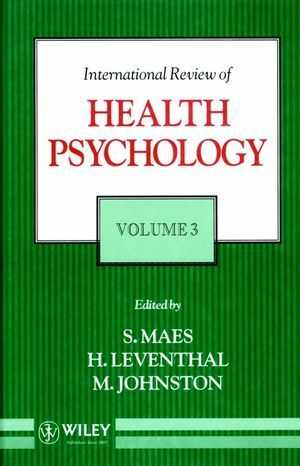 This volume contains contributions on "A psychological look at public health: contents and methodology", "Stress resistance resources and health: conceptual analysis", "Vital exhaustion and the acute coronary syndromes", "Negative affectivity, subjective somatic complaints and objective health indicators. Mind and body still separated? ", "Promotion of health: integrating the clinical and public health approaches", "The prevention of suicidal behavior: a review of effectiveness", "Regulatory innovations, behavior and health: implications of research on workplace smoking bans", "Self-regulation and control of rheumatic disorders", and "Psychological preparation for surgery: marshalling individual and social resources to optimize self-regulation". S. Maes and H. Leventhal are the authors of International Review of Health Psychology, Volume 3, published by Wiley. Self-Regulation and Control of Rheumatic Disorders (D. Park). Psychological Preparation for Surgery: Marshalling Individual and Social Resources to Optimize Self-Regulation (R. Contrada, et al. ).